The main difference between VLDL and LDL is that VLDL contains more triglycerides whereas LDL contains more cholesterol. Furthermore, VLDL carries triglycerides from the liver to the adipose tissue while LDL transport different types of fat around the body. Moreover, LDL is a type of ‘bad cholesterol’ since elevated levels of LDL in the body can increase the risk of heart disease and stroke. VLDL and LDL are two types of lipoproteins responsible for the transport of lipid molecules through the blood and extracellular fluid. Both of them contain triglycerides, cholesterol, proteins, and other fats in variable amounts. VLDL (very-low-density lipoprotein) is a type of lipoprotein found in the circulation. Generally, VLDL contains 10% of cholesterol, 70% of triglycerides, 10% of proteins and 10% of other fats. The formation of VLDL occurs in the liver and its main function is to transport triglycerides from the liver to the adipose tissue. 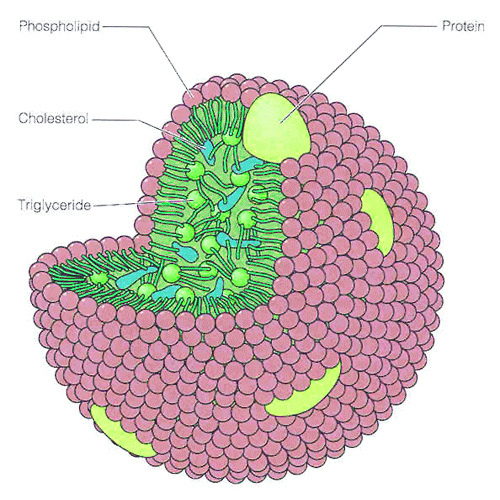 Typically, triglycerides are used by the cells for the production of energy. However, consuming more carbohydrates leads to the formation of excessive amounts of triglycerides in the body, which in turn increases the amount of VLDL in the circulation. However, fat cells store the excess triglycerides for the future use for energy. On the other hand, high levels of triglycerides lead to the building up of hard deposits called plaques inside the arteries. These plaques can increase the risk of heart disease and stroke due to inflammation, changes in the lining of blood vessels, increased levels of blood pressure, and decreased levels of good cholesterol. LDL (low-density cholesterol) is another type of lipoproteins in the blood. Usually, VLDL is converted into LDL by the action of enzymes in the blood. However, LDL contains high amounts of cholesterol, but lower amounts of triglycerides. Generally, LDL contains 26% of cholesterol, 10% of triglycerides, 25% of proteins, and 15% of other fats. The main function of LDL is to transport cholesterol throughout the body. Therefore, higher levels of cholesterol in the body leads to higher levels of LDL. Just like in VLDL, higher levels of LDL in the blood leads to the formation of plaques inside arteries, which in turn leads to atherosclerosis, hardening and narrowing arteries. Thus, this reduces the volume of blood that flows through the artery, causing heart attack and stroke. VLDL and LDL are two types of lipoproteins responsible for the transport of lipids through the blood and extracellular fluid. They contain variable amounts of triglycerides, cholesterol, proteins, and other fats. Also, both occur in small amounts in the circulation under normal conditions. 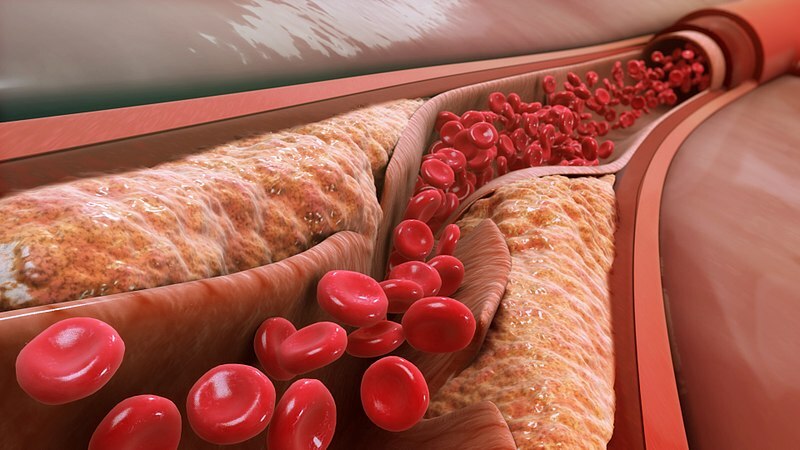 Besides, both collect inside the artery walls, causing atherosclerosis. VLDL (very-low-density cholesterol) refers to a plasma lipoprotein produced primarily by the liver that contains relatively large amounts of triglycerides compared to protein, and that leaves a residue of cholesterol in the tissues during the process of conversion to LDL. In contrast, LDL (low-density lipoprotein) refers to a lipoprotein of blood plasma composed of a moderate proportion of protein with little triglyceride and a high proportion of cholesterol and that is associated with increased probability of developing atherosclerosis. Thus, this is the main difference between VLDL and LDL. VLDL is composed of 10% of cholesterol, 70% of triglycerides, 10% of proteins and 10% of other fats while LDL is composed of 26% of cholesterol, 10% of triglycerides, 25% of proteins, and 15% of other fats. Moreover, VLDL contains more triglycerides while LDL contains more cholesterol. Density is another difference between VLDL and LDL. The density of VLDL is 0.95–1.006 g/mL while the density of LDL is 1.019–1.063 g/mL. 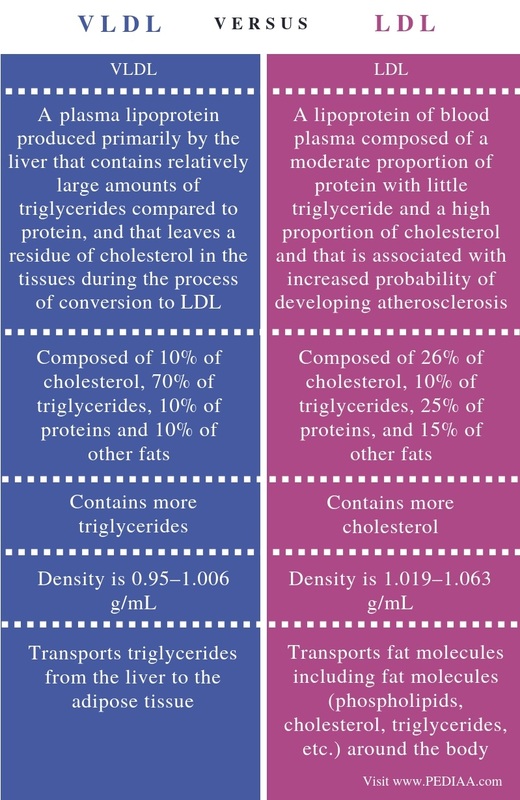 Furthermore, VLDL transports triglycerides from the liver to the adipose tissue while LDL transports fat molecules including fat molecules (phospholipids, cholesterol, triglycerides, etc.) around the body. This is another difference between VLDL and LDL. VLDL is a type of lipoprotein that circulates through the blood, containing a high amount of triglycerides. It transport triglycerides from the liver to the adipose tissue. In comparison, LDL is another type of lipoprotein which contains a higher amount of cholesterol. The main function of LDL is to transport cholesterol throughout the body. Both types of lipoproteins can form deposits inside arteries. However, the main difference between VLDL and LDL is their composition and role.